The Fantasy Grounds page on Steam describes it as "a hybrid application which allows you to play and create your own RPG games." It's not a game in itself, but instead a series of tools supporting specific rulesets, enabling players to take part in pencil-and-paper-style gaming sessions run by an actual DM, over the internet. And it now officially supports the most famous RPG of them all: Dungeons & Dragons. Fantasy Grounds users may now purchase the Complete Core Class Pack, which includes all the classes, feats, spells and equipment of D&D 5th Edition, or purchase individual classes separately; the same goes for monsters, which are available in packs—Beasts, Celestials and Fiends, Dragons, Humanoids, Undead, and so forth—or the whole lot in the Complete Core Monster Pack. There's also a full module available, Lost Mine of Phandelver, an adventure for four to five first-level characters that takes place not far from the city of Neverwinter. 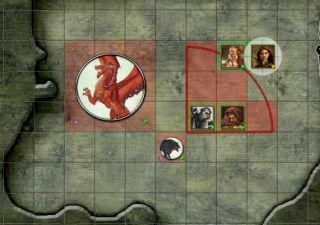 It includes five pre-generated characters, DM maps with locations linked to story elements, images that can be shared with individual players or the entire group, and more. Fantasy Grounds boss Doug Davison told Polygon that more modules are on the way. "We just finished up the preliminary work on the Hoard of the Dragon Queen adventure module, and so that’s currently in review right now," he said. "We’ve already conducted our internal reviews, and now it’s out in the hands of a few folks at Wizards of the Coast. So depending on well how much needs to be changed during that process, I think you’re looking at a matter of maybe weeks before that’s available." It's not an especially cheap setup—the Complete Core Monster and Class Packs are $50/£30 each, and an unbelievable $1,275 worth of DLC is available on Steam—but as Josh De Santo of Genius Loci Games explains in the tutorial video above, they're probably not necessary, at least at first. The D&D Basic Rules and Theme Pack sells for just $3 and includes around 100 monsters in the DM section along with the four basic character classes and races, more than enough to get an adventure rolling. Fantasy Grounds itself alluded to the same thing in the announcement of the D&D license, saying, "Dungeon Masters can often get by with just the Adventure of their choice and one or two Monster Packs." And for DMs willing to put in the effort, Fantasy Grounds' real strength is that it allows the creation of modules from scratch by creating linked story entries and backing them with maps and art found online. It's a complex system, almost intimidatingly so, but then so is running a decent D&D campaign. And being able to create that kind of experience, and then share it with others from around the world, is a genuinely exciting prospect. If Fantasy Grounds doesn't look like it's up your alley, Roll20 and d20pro are two alternatives.